With or without the seafood you should try this. 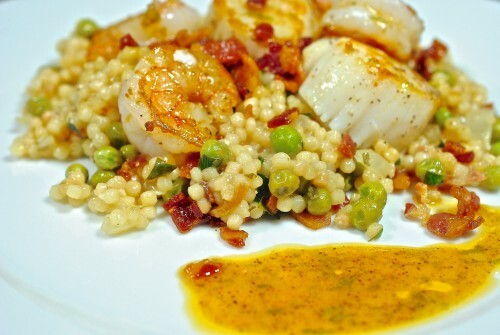 One night in Vancouver CA (hub) had that wonderful Green Pea Risotto with pan seared Halibut; I had scallops and tiger prawns with a chili citrus butter sauce and it was perched on top of Israeli couscous. Normally I feel like I can pick out all flavors in a dish. Every bite I took of this dish got better and better, and I could never identify the flavor that I was loving in this pile of tiny pearl shaped pasta. The pancetta was easy (it was listed on the menu) but I could not come up with that mystery ingredient. Finally I flagged down the waiter and he said he would ask the chef. Surenuf, it was tarragon. Both our plates had roasted golden beets, baby carrots (with green tops) standing up on the plate and mine had broccolini, which all really went well with the couscous. When I was buying the ingredients for this, I bought a container of tarragon, totally forgetting we had planted it this year. Well, maybe after the tarragon I bought withers and gets thrown away I can find a new use for what I have growing outside. Blue Crab Restaurant in Victoria was where we had both of these wonderful meals and what made it even better is that we were perched right on the water where we could watch all the ships and cute little water taxis come and go. So, another toast to our 45th anniversary. 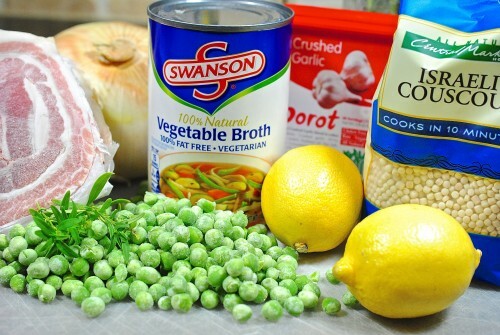 Some info on couscous. It was voted as the third-favorite dish of French people in 2011. 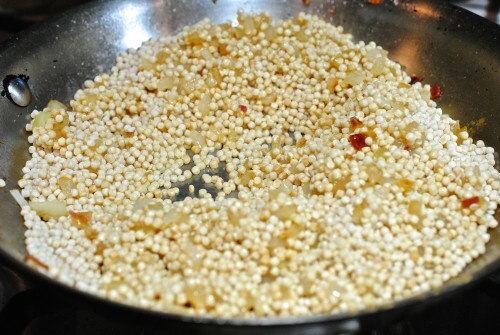 It is known as a North African dish and is made from two different sizes of husked and crushed semolina and is normally cooked by steaming but can also be cooked in a liquid. You know when it is done when it is tender, not al dente and not mushy. The grains should be separate and taste moist, not wet or dry. So, now that you have that information, venture out and try this recipe. 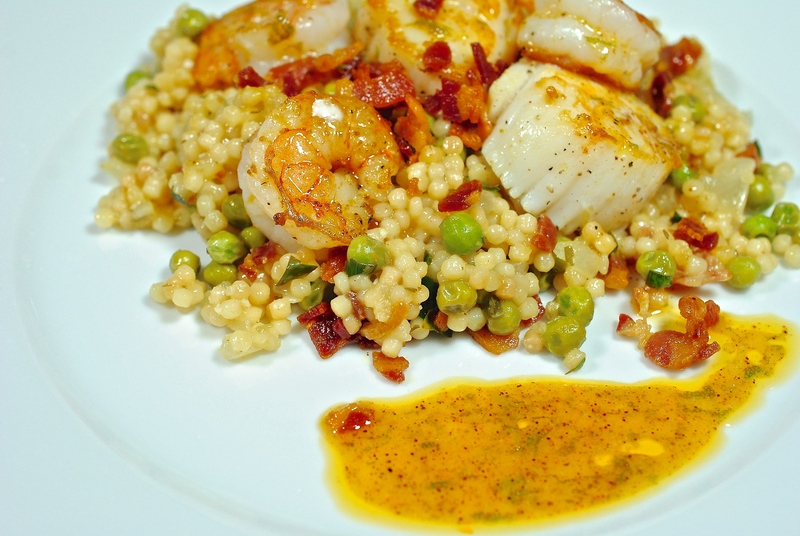 This recipe is for the couscous part of my meal but I have included a Chili Citrus Butter Sauce that you can try if you add scallops and shrimp to this dish. BLAST FROM THE PAST: Grown Up Fish Sticks are so easy and yummy you need to put these on your list of must ttys. Forgot the parsley in the picture so don’t forget to add it. Saute the chopped pancetta and drain on paper towel. Saute the onion in about 1 tablespoon of olive oil and 1 tablespoon of the pancetta fat. 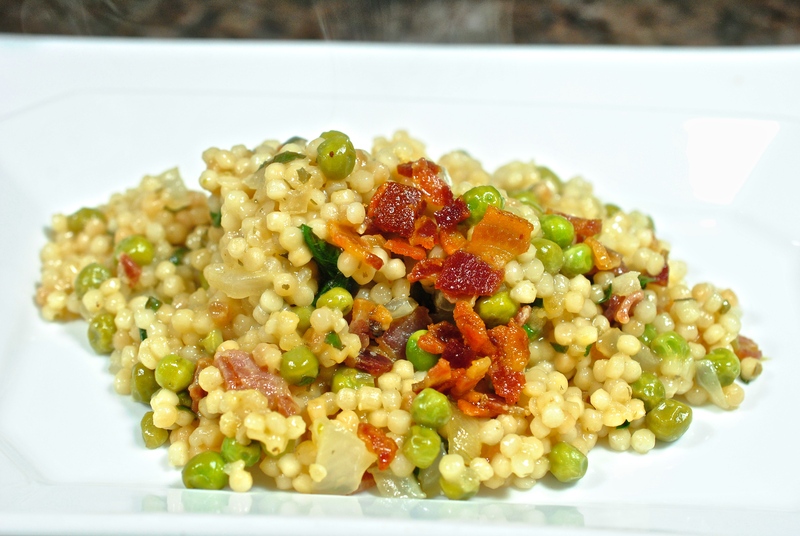 After sautéing the onion, stir in the couscous and stir for about 3-4 minutes. 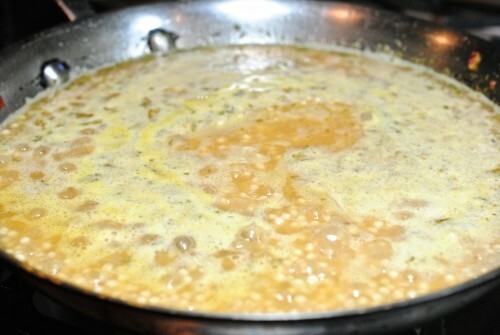 Stir in the broth, bring to a boil and then simmer 8-10 minutes. 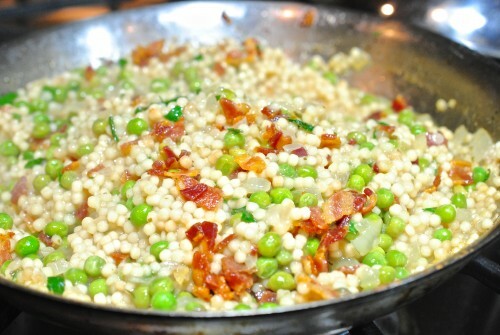 Stir in the pancetta, parsley, tarragon, green peas and lemon juice; salt and pepper to taste. Add the thawed peas toward the end because if you don’t you will end up overcooking them like I did. This is the citrus butter sauce that I used over the scallops and shrimp and puddled around the couscous. 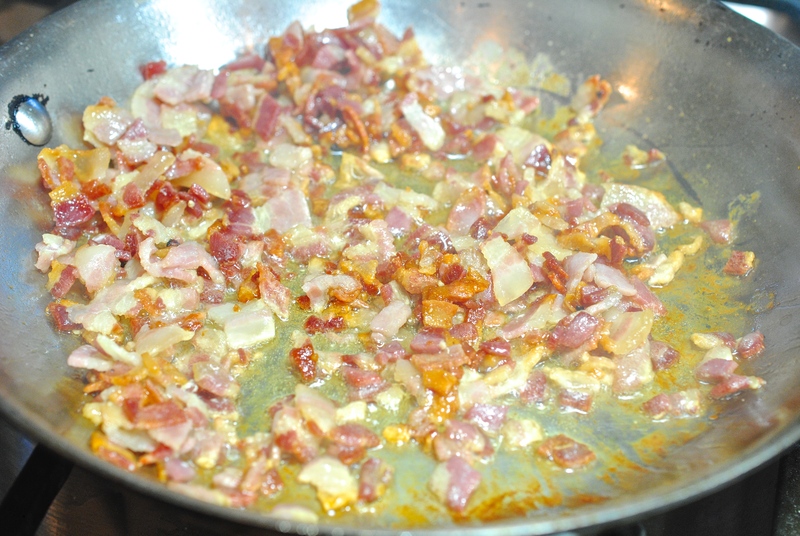 Saute the pancetta in a skillet until brown and crisp. Drain on paper towels and set aside. Heat the olive oil and the pancetta fat in 2 quart saucepan or skillet over medium heat. Add the chopped onion and sauté 5-6 minutes. Add couscous and saute, stirring constantly, until well coated and aromatic, about 2-3 minutes. Add broth, bring to a boil. 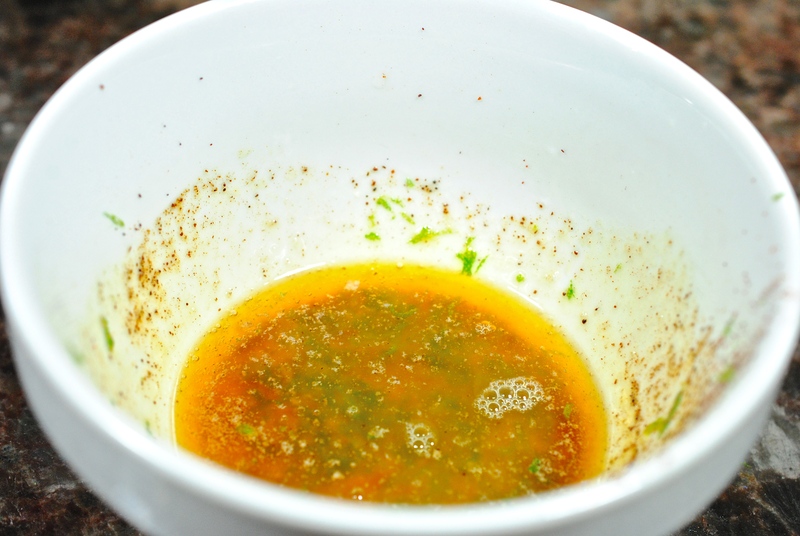 Reduce heat to medium-low and simmer until just tender, about 10-12 minutes. Last few minutes stir in the lemon juice, parsley and the tarragon and the frozen green peas. 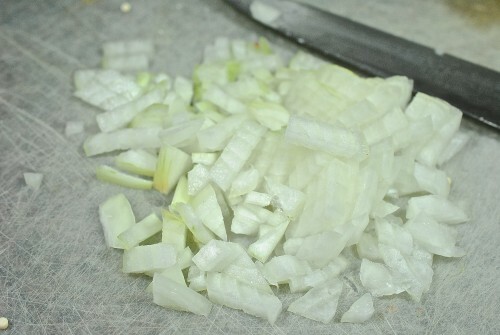 In one tablespoon of the butter sauté the shallots until translucent being careful not to burn. Quickly add in the lime juice, zest, chili powder and start adding the chilled butter and whisk just until barely melted. Add in salt to taste and spoon this over your scallops.